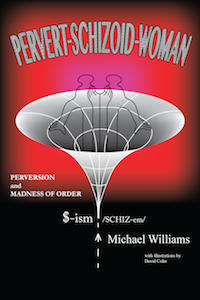 “Pervert-Schizoid-Woman” is a work of philosophy by Professor Williams of the Berklee School of Music. I provided the illustrations and designs over the course of a year. The collaboration involved regular meetings about the ideas and the images. It is a deconstructionist work focussing on Freud, Marx, and Saussure that provides a vision of a radical future at the same time that it critiques a western metaphysics of presence established upon the scene of castration. The philosophy is ultimately constructive of a future in which perversion conceived as the only possible affirmative attitude towards the contradictions of a psychotically structured society of neurotics grounds a new orientation of the subject towards the world. Click on the image below to purchase.